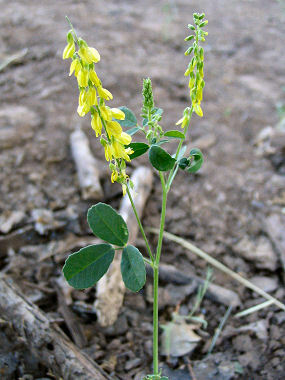 Yellow Sweet Clover is a member of the Pea Family. The plant grows to 5 feet in height and has light green, leaves that grow in a cluster of 3 leaflets to 1 inch in length each. The plant typically grows along roads and in fields at elevations below 8000 feet. Yellow Sweet Clover was introduced to the US from Eurasia. Yellow Sweet Clover blooms between June - August and produces a cluster of yellow pea-like flowers to 1/4 inch in length which grow along a flower stalk to 6 inches in length.